Now that we’re in the dog days of summer, nothing looks more appealing than a spacious, well-designed roof deck that just happens to have a water tower perched above it. 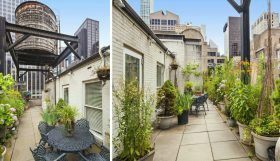 That’s the case at this Midtown West condo at 40 West 55th Street, now on the market for $2.5 million. The one-bedroom penthouse is literally surrounded on four sides by an outdoor space lined with greenery. Inside, a skylight and southern, western and northern exposures that look out onto the lush terrace result in a modern, bright interior.